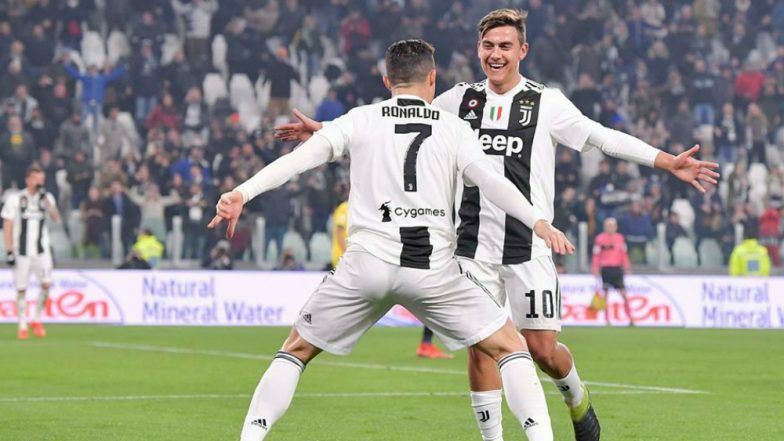 Juventus vs AC Milan, Italian Serie A 2018–19 Live Streaming and Telecast Details: Where and When to Watch JUV vs ACM Football Match Live on TV and Online? Juventus playing AC Milan is one of the most sought after fixtures in the Italian Serie A with both sides having so much history about them. Over the past few years, Milan have been on the decline but the importance of the game is such that expect A C Milan players to give their all. After a fine start, they seem to have slowed down a bit in the current term needing a win at Turin to keep their hopes of playing Champions League football alive. For Juventus, a win at home coupled with a loss for Napoli means an eight successive Serie A title – so there is plenty to play for ahead of European tie against Ajax. Cristiano Ronaldo will not feature for Juventus as he continues his recovery from a muscle problem suffered on national duty. It is highly likely that the Portuguese forward is being saved for a crucial quarter-final tie against Ajax. Moise Kean who was racially abused in the last game is creating quite a storm on the pitch with his performances. He will partner Mario Mandzukic to form a formidable strike partnership with Miralem Pjanic running the show from midfield. What will be interesting to see is the performance of Leonardo Bonucci after his controversial statement in the aftermath of the entire Keane incident. AC Milan manager Gennaro Gattuso has included Ivorian midfielder Franck Kessie in his 23 man squad to face Juventus. If he does make the starting eleven, he will provide some much-needed lift to the Milan camp. Suso should partner Krzysztof Piatek in the strike and the duo have goals in them as they complement each other well. First choice goalkeeper Gianluigi Donnarumma is still out enabling Pepe Reina to continue between the posts. The hunger to warp up the title race in record time will be enough for Juventus to claim all three points against Milan. When is Juventus vs AC Milan, Italian Serie A 2018–19 Football Match Schedule (Date, Time and Venue Details)? Juventus and AC Milan lock horns against each other in the Italian Serie A match on April 06, 2019 on Saturday. The Juventus vs AC Milan football match will be held at the Juventus Stadium. It will kick off at 09:30 PM IST. How to Watch Live Telecast of Juventus vs AC Milan, Italian Serie A 2018–19 Football Match? Sony Sports Network is the official broadcaster for Italian Serie A (2018-19 season) in India. The fans can see the live match telecast on Sony Ten 1 channel to see Juventus vs AC Milan match on their TV sets. Where to Get Free Live Streaming Online of Juventus vs AC Milan, Italian Serie A 2018–19 Football Match? As Sony Sports Network holds the official broadcasting rights of the Italian Serie A this season, the fans will also be able to see the match via Sony Sports' live streaming service, i.e. SonyLiv. Stay tuned with us for all the latest updates about Italian Serie A 2018-19! SPAL vs Juventus, Italian Serie A 2018–19 Live Streaming and Telecast Details: Where and When to Watch SPAL vs JUV Football Match Live on TV and Online?